The EWG adds that studies show that farmed fish accumulate PCBs from their fishmeal diet. They go on to say that if the EPA set health guidance levels for PCBs in farmed salmon the same as it does wild-caught salmon, they’d limit consumption to once a month. For years, I haven’t eaten farmed fish more than once monthly — and I really love salmon. I certainly wouldn’t feed farmed fish to an animal more often than that, let alone for every meal. Fish farming damages the environment as well, pouring liquid waste into the sea. It also takes much more fish to feed the farmed fish than those farmed fish ultimately produce. This Time Magazine article Is Fish Farming Safe? will probably turn you off fish farming forever. Sadly, farming isn’t even good for fish. The farmed fish pass disease and parasites (like sea lice), and also pass weaker genes when they breed with wild fish. This seems to be endangering wild salmon worldwide, cutting populations by 50% or more when the wild fish encounter fish farms or their escaped fish. (Not surprisingly, some salmon farmers disagree with these findings.) 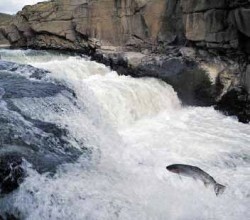 Read National Geographic’s article Farmed Salmon Decimating Wild Salmon Worldwide for more on this. So, my advice is this. Read up and investigate. I’ve personally read enough to feel uncomfortable feeding salmon (including treats) to my own dogs, but you should decide for yourself. Call manufacturers to find out if fish in your pet’s food is farmed. (Hint: it’s very unlikely that it’s wild unless it’s very expensive.) You probably won’t find the information you’re looking for on pet food websites. Search on-line by product name or parent company to find a toll-free number and call them. Better yet, find a number on the bag or can. If there’s no number, don’t feed that food anymore. In any event, I recommend feeding a wide variety foods, avoiding salmon, fish and fishmeal. Be sure to check labels. Even chicken and beef products often contain fish. And because PCBs accumulate in fat, always buy fish oils made from wild fish. Carlson and Nordic Naturals, available widely at health food stores and on-line, both make good products. Learn more about dog food, switching foods, and dog food myths at my website Dogs4Dogs.com. And if you like this article, please bookmark it and pass it on. Also watch for another article on selecting pet food in our new Blog4Dogs. Popped by from blogcatalog and found your blog. Is farmed salmon really that good for people either? This is really interesting as I have never really thought about farmed fish before, except that I knew it was more fatty. I never realised that it could be used for dog food and I am betting it isn’t even the meat but the skeleton/bones etc that is used. thanks for opening my eyes. I’m glad the article was helpful. Before long, farmed fish will be all that’s available. It’s scary. And you’re right: pets get the dregs. I hope you’ll read our two new vaccination articles as well. And stay tuned for a heartworm medication shocker. To get notifications about new articles, you can subscribe to the blog http://www.truth4dogs.com or our free newsletter http://www.dogs4dogs.com or follow us on Twitter http://www.twitter.com/k9author. I would be more worried about just plain rot than “farmed vs. wild”. Fish rots so quickly, and you can be sure that the rotten fish will show up in pet food. Even the fish in the grocery meant for human consumption is not so fresh, as you can smell when you go near the seafood section. I once gave my two cats pet food with fish meal as an ingredient, and both started vomiting shortly thereafter. What if any dry dog foods contain WILD or ALASKAN salmon, or fish? Which contain FARMED salmon or fish? Lisa, sorry, but I can’t recommend a food. I’d presume they all contain farmed fish unless they state otherwise. You might do a web search. *** The use of wild Alaskan salmon & salmon meal (not stripped of oil), with high Omega 3 in ALL the foods, and never Ethoxyquin is a HUGE reason I’ve fed Timberwolf Organics for years. I have been feeding my dogs the costco Nature’s domain fish and sweet potato dog food for a couple years. They both have fatty tumors all over their bodies. I realized they must be using farmed salmon. Has anyone else had this experience? My gut feeling is that the recent onslaught of tumors was caused by this. Jami, it’s not a good idea to feed any animal the same meal year after year. I don’t know if it contains farmed fish, but I’ve always suspected that pet food doesn’t have wild salmon flesh. It would be far too expensive.